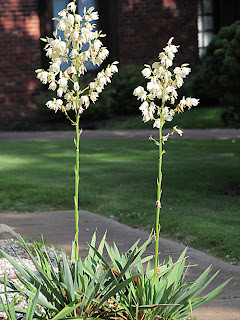 One of the plants I find myself talking about most is Yucca. There are a few varieties within the United States including y. glauca and y. filmantosa, the latter being native to the southeast US. Planted as an ornamental shrub around driveways and mailboxes Yucca has expanded along roadsides, drainages, and parking lots throughout western NC. Known by settlers for its ability to produce soap suds (roots), and therefore shampoo, Yucca has a few other important uses for mountain people and nature students. Some times are better than others for harvesting, depending on purpose, and we are in a prime time right now for one of the most exciting uses! Few outdoor and primitive skills are more fundamental than the ability to make cordage, start fire, weave a container of some sort, catch fish, repair a wound, or stay clean. Yucca can provide for all of these. It amazes me how many people walk around with a haughty attitude about natural knowledge and the woods because they live in the country or occasionally hunt when in reality they know very little. Just as in martial arts the attitude of “I already know that” is a roadblock to learning and should be dismantled immediately regardless of age or experience level. Do you know about Yucca? If not, follow onward! One easy to find source of fiber for making cordage, or natural rope woven by hand, is the inner bark of various trees. Tulip / Poplar is a fun material that works best when slightly rotted or wet for a period of time but it can be a little weak. Human strength can break a small to medium cord, but it works well for necklaces and bracelets, especially if you’re concerned about wearing an unbreakable garrote. Yucca fibers, however, are incredibly strong. I haven’t applied scientific testing in comparison to the cordage from Basswood, which is not breakable by human strength, but Yucca is far stronger than Poplar bark. My friend Eugene Runkis made a 25 foot tapered fly fishing line from Yucca fibers that he has used for years and which is featured in the Moonshining episode of Hillbilly Blood, season 1. Splicing is easy, and for short sections, the length of a single lance shaped leaf, the fiber comes complete with a needle attached to the end. The needle is so sharp it can pierce skin and be used to sew a wound. I once thought wound sewing was some far-out advanced stuff but have saved at least three animals with wound sewing prowess; learn to suture. One of the more odd facts about Yucca is that it’s a fish narcotic, and when used in a contained area of water can cause fish to become slow and dumb, even floating up to the surface where they can be collected by hand. Since we’ve already mentioned shampoo I’m just going to skip to my personal favorite use of Yucca and why RIGHT NOW is a crucial time for YOU to go and grab some! I sometimes call myself the lazy survivalist. In actuality what that means I like to stay warm, dry, comfortable, and enjoy my place in the wilderness and use intelligence and natural resources to provide time to enjoy the view, smell the flowers, watch the critters, contemplate existence. Imagine what life is like when humans struggle every moment to survive; warzones, extreme poverty, natural disaster zones. This means very little in the way of thinking; no philosophy, art, music, innovation, etc. Striving to get ahead of struggle is a worthy accomplishment for more reasons than being lazy I assure you. Well, in the pursuit of speed and ease I have found Yucca to be #1 of all possible materials to be used in a fire by friction kit. Fire by friction is a term that refers to the production of fire by the process of rubbing things together. For a bow drill FxF kit one needs a hand hold, bow, spindle, and fire board or hearth. Yucca not only makes a fine cord suitable for temporary use on the bow but the stalk of the plant is the perfect balance of all qualities for a coal starting material. It’s hard enough but powders quickly. It is already round so we don’t have to carve anything! That’s a big deal! Simple shaving to shape the cylinder is adequate. The only real problem with Yucca as a fire spindle is worms. These little worms crawl in to eat and hang out all Fall and Winter. When you grind your spindle down into one they squish out adding lubrication to the fire hearth, which is the opposite of friction. No coal = no fire. Worm squish. No fun. If the worm has eaten enough then the spindle can actually fall apart and break from weakness, plus all the worm holes let in water which degrades the stalk faster. There is a very easy fix for all of this, however. Harvest your Yucca before the worms get to it. That’d be the happy middle between when the plant flowers and seeds and when the worms get in! That’d be just about now depending on your location! Up here in the high elevations we have a little longer to go before the plant fully reproduces for the season but some areas are getting very close. If your Yucca source is in no need of conservation because there is plenty then harvest away. Let it dry naturally, and of course choose the straightest stalk you can find. Some people like the thick stalk but remember thin stalks reach a higher RPM/spin rate so they make up for the reduced surface area. Experiment with both. Thinner weighs less too and is smaller which can be helpful for light travelers.